This book is a breakthrough. Seth Godin, author of Linchpin An empowering, encouraging work that will challenge readers to reach for excellence. Publishers Weekly Have you ever wanted to learn a language or pick up an instrument, only to become daunted by the task at hand? Expert performance guru Anders Ericsson condenses three decades of original research to introduce an incredibly powerful approach to learning that is fundamentally different from the way people traditionally think about acquiring a skill.Traditionally, we believe we need innate talent to excel, or think excelling seems prohibitively difficult. 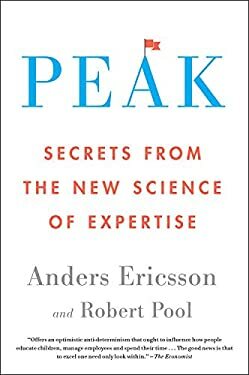 Peak proves that almost all of us have the seeds of excellence within us it s just a question of nurturing them by reducing expertise to a discrete series of attainable practices. Peak offers invaluable, often counterintuitive, advice on setting goals, getting feedback, identifying patterns, and motivating yourself. Whether you want to stand out at work, or help your kid achieve academic goals, Ericsson s revolutionary methods will show you how to master nearly anything.